Last week, a self-proclaimed white nationalist was arrested on gun and drug charges. Fifteen guns and over 1,000 rounds of ammunition were found in Lt. Christopher Paul Hasson’s Maryland apartment. Prosecutors discovered that he was plotting the murders of several well-known Democrats and journalists. The prosecution found that in a letter, Hasson wrote: “I am dreaming of a way to kill almost every last person on the earth.” He has been labeled a “domestic terrorist” by the prosecution. It is incredibly easy to purchase a gun. According to the Bureau of Alcohol, Tobacco, Firearms and Explosives, there are about 65,000 firearm dealers across the United States. To put this into perspective, that’s 4.5 times the amount of McDonald’s restaurants in the country. 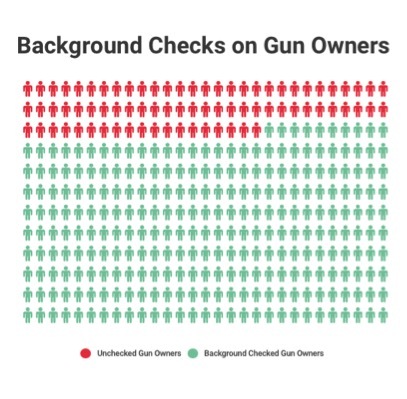 Licensed gun shops are required by federal law to conduct background checks, but gun sellers that are unlicensed are allowed to sell without a background check. This is a commonly exploited loophole. Only 13 states require background checks for every gun sale, so it is easy to buy from friends or at gun shows without a background check. Twenty-two percent of gun owners are not given a background check, according to a 2017 study by Harvard University. This 22 percent could consist of felons, drug addicts or domestic abusers. In 1995, a “Connecticut law requiring a permit or license – contingent on passing a background check – in order to purchase a handgun” was enacted. A study conducted by three universities found that over the next 10 years if all states enacted this Connecticut legislation, thousands of lives would be saved each year. It’s illegal for the government to keep a database of firearms and gun owners, according to the Firearm Owners’ Protection Act of 1986. Hasson stockpiled 15 guns over only two years. Imagine if Hasson was not acting alone, and he had formed a domestic terrorist group. With current U.S. laws, he could have continued to buy guns and ammunition, and pass these out to other domestic terrorists. If he were not caught, he could have created a group ready for mass destruction. He could have killed thousands of people. Stricter gun laws must be passed, requiring background checks on every change of ownership. Even if Hasson did not pass background checks, anyone he knew with a clean record can easily buy guns for him, and therefore he could bypass the background check. When guns change hands, there’s no record. In fact, it’s illegal for the government to keep a database of firearms and gun owners, according to The Firearm Owners’ Protection Act of 1986. In addition, all records of background checks must be destroyed within 24 hours. This creates a loophole for anonymous distribution of guns and ammunition. According to the U.S. Department of Justice, “large numbers of firearms are sold anonymously.” This is unacceptable. Laws must be enacted that require a background check for every single time a gun changes ownership. There must be a registry that keeps track of gun owners and the number of guns each person owns. Without these laws enacted, cases like Hasson’s will continue to happen.